I have a confession to make. 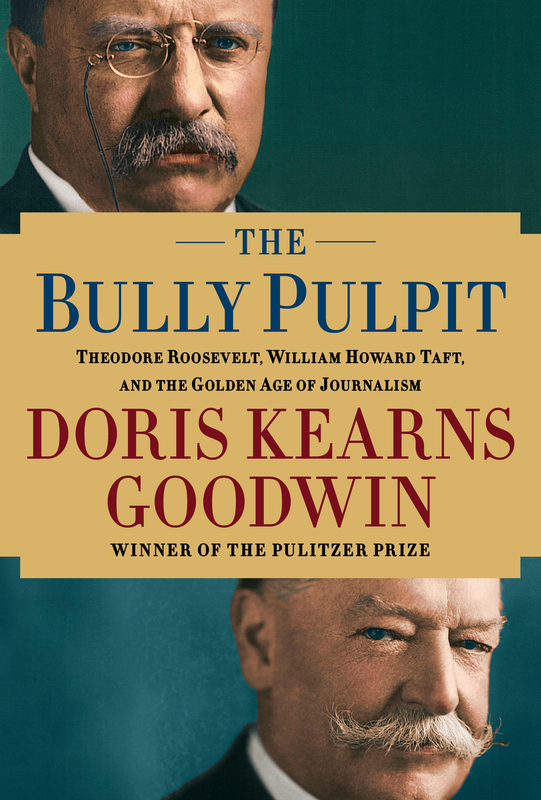 I am a huge fan of Doris Kearns Goodwin’s books. Yes, I say this despite the plagiarism scandal and her recent performance at the Gettysburg 150 commemoration this past July. I do not subscribe to the “three strikes” rule. Goodwin tells exciting stories about our most important political leaders and the times in which they lived. Occasionally, you can sense a whiggish streak running through the narrative, but it’s rarely overbearing and rarely evolves into full-blown sentimentality. [That happens more often than not during interviews.] She is one of the few popular writers who has the ability to remind the country that its collective memory extends beyond the past few weeks. I don’t know anyone else right now who could sell me on a 750 page story about Teddy Roosevelt and William Howard Taft. Teddy has always fascinated me, but I’ve never given a second thought to Taft. After listening to a couple of interviews over the past few weeks, however, I decided to purchase a copy with an Amazon certificate. I haven’t been able to put it down since it arrived on Wednesday. Goodwin is extremely enthusiastic about her subjects. Of course, she wants to sell books, but she also wants Americans to embrace these stories as well. History has a way of tempering our sense of self importance and the conviction that we are living in exceptional times. It’s not a book that I want to read on a tablet. I want to feel its size. It should weigh you down just a little if you are taking it with you out of the house. Regardless of how you read it there is something satisfying in knowing that you are taking part in a larger conversation or – dare I say – collective remembering. Finally, I can’t help but admire the discipline that goes into one of these books. Goodwin may not be digging through mountains of archival papers for her tomes, but careful thought has clearly gone into the construction of the narrative itself and this almost always results in a fresh perspective. In short, DKG leaves me with that childish excitement that I felt when I first discovered a love for history. That may sound corny to you, but I assure you that such a skill is in short supply these days. I could write more, but I want to get back to my book. I wholeheartedly agree. I love her enthusiasm and her storytelling ability, which is something we could all learn from. I give her a pass on the plagiarism, in part, because she relied on her researchers to do their job properly. Not only did she learn her lesson, she did something that Stephen Ambrose never did when he, too, got caught–apologize. She’s far better at interviews than Michael Beschloss, in my opinion. The first book I ever read of hers was her first presidential biography, on LBJ. Since she had been his White House intern, she had better access than most. It was the beginning of a string of terrific books about presidents. What she gets about them is not that these men were officials, but that they were human. It’s that human story that appeals. Now you’ve got me wanting to read this book! What she gets about them is not that these men were officials, but that they were human. It’s that human story that appeals. Now you’ve got me wanting to read this book! Absolutely. Who knew that William Howard Taft and his wife would make for such good reading. Thanks for the comment. I don’t know what McCullough not having written a book about the Civil War has to do with anything I’ve said here. I am also a fan of his and have read most of his books. The Bridge is by far my favorite. Still, I prefer DKG when it comes to 19th and 29th century politics. BTW, one of my students is reading McCullough’s book, 1776, which I wholeheartedly support. I guessed you were a fan of Doris Kearns Goodwin because she wrote about Lincoln’s cabinet. I’ve been reading her for quite some time. Yes, DHF’s book is also well worth reading. Thanks again for the comment. I’ve looked at the book a couple of times but, frankly, the subject matter is just not calling me and to invest that much time in a book I had better be interested in the subject matter. Moreover, from the reviews I’ve read it seems as if the story is about TR but since he has been written about often, she had to come up with an angle (which is what she did with Team of Rivals but that’s something I was interested in). So far Goodwin has maintained a healthy balance between the two as well as their wives which I am finding just as interesting. I’ve been waiting for this to come out since I heard about it a few months ago. When I first started reading it, most of it was refresher since I’ve read Edmund Morris’s three volumes on TR and Henry F. Pringle’s two volumes of Taft (which is an interesting read, I have to say). My main purpose in getting the book is to see how she handles Ida Tarbell and the other muckrakers (a name Tarbell hated, by the way). Given that I’m currently writing a book-length study of Tarbell’s Lincoln studies, I want to see how an established and popular historian handles her life. So far, so good. Just as an aside, if anyone is interested in reading more about Tarbell or McClure, there are a number of good books available, Kathleen Brady’s “Ida Tarbell: Portrait of a Muckraker” is still in print and is the best (and only) biography available. Steve Weinberg recently published a book “Taking On the Trust” about Tarbell’s battle with John D. Rockefeller. Peter Lyons, a descendent of McClure, wrote his biography and in spite of being a family member avoids hagiography. It’s out of print but is available second-hand. Finally, for a good history of McClure’s Magazine and the journalism of the time see Harold S. Wilson’s “McClure’s Magazine and the Muckrakers” which is also out of print and available on the secondary market. A book-length examination of Tarbell’s Lincoln studies sounds fascinating. Best of luck with it. Glad to hear that Goodwin is on track in your mind. I just started the chapter on McClure’s. Thanks, Kevin. Even though Tarbell is best known by people for her Rockefeller pieces, she said throughout her life that she was most proud of her Lincoln work. Indeed, she wrote about Lincoln up to the point where she could write no more, but she never updated the Standard Oil book. I created a page at Academia.edu under my name and attached a draft of the book proposal to it for anyone interested. Will check it out. Thanks. Watched the CSPAN video of a panel discussion at the Lincoln Forum. A question came up: Who is the Edward Everett of today? James McPherson did not answer and the other panelists seemed to feel that Americans no longer wanted to hear the sort of combination of history and contemporary events that Everett deployed. Harold Holzer, however, gave an actual name-DK Goodwin.